Former Super Girl, Tan Weiwei, is the latest veteran vocalist to join I Am A Singer. I Am A Singer recaps are back by popular demand (and because, when you put “blogging for Cfensi” on your CV, it’s probably a good idea to publish something recent—hello there, prospective employers!). Kit Chan was predictably eliminated. Bye bye, Kit Chan~ Sorry, Singaporeans. Li Jian 李健 was brought in to replace Li Ronghao. He’s stuck around since then. Mongolian stuff was popular for a while. And Sun Nan sang with a Mongolian singer, Amguulan 阿木古楞. Pretty sure Amguulan is a boy’s name, but who am I to judge? Jane Zhang sang, and rapped, in English (Bang Bang by Jessie J, Ariana Grande and Nicki Minaj). It was okay. But she should have brought in Zhang Jiaojiao 张娇皎 to do Nicki Minaj’s part. Someone in the audience called Han Hong a pretty-boy stud-muffin 小肉鲜, and I have no objections to this. And now you’re all up to date! More or less. This faux-operatic number was written as an ode to former premier Zhou Enlai to commemorate the centenary of his birth. So, 1998. A lot of Chinese classics aren’t as old as you would think. “Red songs,” as they’re known, haven’t been very popular on I Am A Singer. After all, this is Hunan TV, and rival CCTV is all the way in Beijing. In season two, “Madonna of China” Wei Wei was booted from the competition after singing Reddest Sun, Dearest Chairman Mao 太阳最红毛主席最亲. Han Hong does better, slightly, in sixth place. She’s not classically trained in the Western tradition, and she sounds a bit poppy at parts, but you can’t deny that she is expressive. She should have been ranked higher. Guess who just learnt how to make gifs? This must be what tumblr feels like. Leo’s jacket looks like it was made from leftover scraps of fabric after re-upholstering grandma’s floral sofa. Which also explains why there wasn’t enough material left to make matching pants. Arrangement-wise, there aren’t really any real moments to this performance, vocally or instrumentally. The parts where you’d expect big notes suddenly fall flat. And the ending is so anti-climactic, I didn’t realise he had finished singing until he thanked the audience 20 seconds later. And so begins the first of three performances that could all be the same, dull song. Part two of the same, dull ballad saga. Li Jian has been performing adequately so far in the competition, but he’s not a strong contender. He hovers around third and fourth place, never really standing out. He’s really good at that sort of thing. And the third and final segment ends, at least, with some bigger vocals. Sun Nan’s lower register is, dare I say it, pleasant to listen to in this performance, but he compensates with extra nasal high notes. I guess some people like that sort of thing. Anson was eliminated last week, so this is his encore performance. Thanks, Anson, for bringing us out of that tripartite medley of ballads. He performs better than a few of the other singers we’ve seen tonight. We’ll see him again in a few weeks when the eliminated contestants return to fight for places in the final. There isn’t much of a market for Latin music in China, but does Jane Zhang care? Nosiree. Jane performs with two Asian Rick Martins as her back-up dancers. Whose idea was it to the show audience reactions instead of the actual dance? Jane has very pretty high notes, but we already knew that, and the audience seems less impressed by them. Jane does have some impressive coloratura techniques, though. If Ricky Martin had a twin brother and was Asian with an enthusiasm for clapping. Well, it took this long for someone to do a Beyoncé number. A-Lin’s English is actually pretty good. It’s better than what Jane pulled off last week, and Jane is famous for singing in English (we’ve raised our standards since her Super Girl days). But the arrangement detracts from the song. Halo is contemporary R&B, and she sucked the R&B out of it. Also, one of the audience members totally looks like a girl version of a friend of mine. I’m going to show it him and see what he thinks. The only difference is that my friend has a scar on his cheek. Kind of makes him look like a shark. After Anson Hu’s elimination last week, Tan Weiwei is the latest replacement I Am A Singer singer. This is pretty neat, because whenever she’s been on the show has a guest performer in the past, she’s absolutely nailed it. “When is she going to be on the show?” we all wondered. And now here she is. She needs to break the top four to continue in the competition. 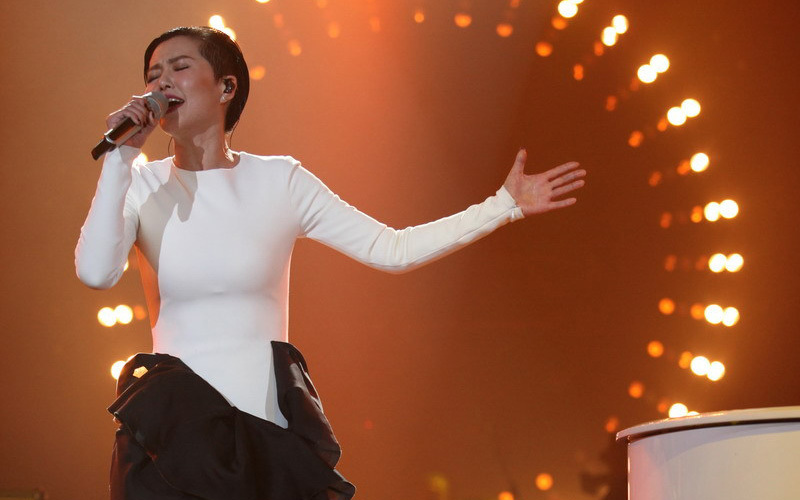 Tan Weiwei is singing Lighthouse, a song by Huang Qishan, who relaunched her career as a powerhouse diva after the first season of I Am A Singer. Lighthouse, in turn, is a Chinese cover of a Korean song, Lighthouse Keeper 등대지기, which is a cover of a Japanese song of the same name 灯台守, which is a cover of a 19th century American Sunday School hymn, The Golden Rule. Oh, that’s right, I did my research. The song isn’t the best choice for a singing competition. There are a some big, high notes in there to spruce it up—really good big, high notes—but they don’t seem to fit. It is a hymn, after all. I imagine this is what Christina Aguilera (over)singing Amazing Grace would sound like. Interestingly, Huang Qishan performed the same song, but better, on the same night, on Day Day Up 天天向上. What’s your game, Hunan TV? Tan Weiwei comes first, guaranteeing her a spot on next week’s show. So, yay. But hopefully she picks better songs in the future. Leo Ku comes last and is eliminated. Is he still emceeing the show? I hope he becomes really vindictive as a host and takes it out on the audience for not voting for him. None of that jovial, affable television host stuff we’ve seen up until now. Just a grumpy, I-don’t-give-a-damn type of guy. That’s the kind of host we need! This entry was posted in Hong Kong, I Am A Singer, Mainland China, Music, Taiwan, Television and tagged A-Lin, Anson Hu, Han Hong, I Am A Singer, I am a Singer 3, Jane Zhang, Leo Ku, Li Jian, Sun Nan, Tan Weiwei, Uwechue Emmanuel by Benji. Bookmark the permalink. If they kick out Jane, do you think they could get Liu Meilin? Because I would love to see again, and if Jane is out, they won’t have to worry about limited resources. Jesse Lee is coming back after that whole X-Factor China disaster? I’m really disappointed that Anson left, but I guess he’s more known for his composition, and the audience don’t necessarily appreciate that. His voice is pretty unique too, so some people may not like it. I’ve been a casual fan ever since he first started in the industry with “Monk.” He’s really unique. I hope he gains a lot more popularity from this. Hope he gets a soul mate soon haha. I’ve actually been pretty disappointed with Jane Zhang’s past two performances. To me, she bombed “Bang Bang.” I guess it has to do with the fact that I’m comparing her to Jessie J, who at least in my opinion has a stronger and more powerful voice. I was expecting a lot, but it just felt really flat. The backup singers were even better. I really don’t get how she got No.1. Her “Samba” is also nothing spectacular (I guess her rank reflects that). The coloratura is pretty good for a pop singer and certainly made the song better, but for the rest of the song, if you didn’t tell me it was by Jane, I wouldn’t have guessed it. I guess I don’t really care for her fast songs. I kind of want her to do some slower ones and put more emotion into her singing. I feel like that might be her forte. A-Lin’s a pretty good singer, but her performances are pretty predictable, nothing exceptional either. Li Jian, Han Hong, and Sun Nan all have their own styles, and their performance are also pretty predictable, I would say. Overall, I’m kind of disappointed in this season. I thought Season 2 was more interesting. Hope to see more changes. Just based on vocal performance, I thought Anson would have lasted longer than Leo. But the I Am A Singer audience seems especially reluctant to vote for younger singers over the older veterans. I didn’t love Bang Bang. But I didn’t think the backup singers were great, either. They seemed almost ornamental, in that “Look at how international I am~ I’m performing with black people!” thing that Jane is wont to do. The arrangement was poorly thought out, too. This show loves its pauses before the big notes, but the pause here killed the momentum and crescendo and made the big note (you know the one) sound really out of place. Han Hong is singing a lot of songs that she’s covered before. I suppose it’s not against the rules since they’re not technically her songs, but it’s not like she’s taking any big risks or anything either. Except for G.E.M, I like the line-up for this season more than the second one. On paper, at least. They’re better singers this time around. But, yeah, they’re all giving very predictable performances. Push the envelope a bit, people! I’m baffled by Jane’s results. I thought Bang Bang was horrible, but I liked her version of 生如夏花 a lot. I feel like Anson Hu should’ve tried more ZGF since those are always crowd-pleasers. Jane, supposedly, had picked out all her songs for the entire run before the season even started. And her team tried to talk her out of doing 生如夏花, saying it wasn’t suited for a singing competition… but she did it anyway. But I’m in the same boat as you. I actually really liked that performance. It reminded me of 远歌 by Huang Ying, which I think is still one of the best examples of blending Chinese folk music with modern pop (without it being overtly 中国风-y, which can sometimes come across as more of a caricature of traditional Chinese music). I didn’t really “get” Bang Bang either. The whole arrangement was really poorly done, which is one of my main gripes about Chinese music—this obsession with turning every song into a pseudo-jazz, pseudo-blues, pseudo-bossa nova… thing. Anyone else, anywhere else in the world, would strip down a song and do an acoustic version. But in China, it’s jazzed up. It’s always jazz. And it’s always terrible. But the audience has never been great with evaluating English songs. Huang Qishan’s I Will Always Love You (hooray for ruining songs with jazz, yet again), except for the big note at the end, was awful. And she still came first.